When I was little, my mom used to make pesto pasta for me all the time. In fact we had it so frequently that I grew to dislike it quite a bit. I know you’re probably wondering how that’s even possible, but it’s true. As I grew older I could never get back into it either until about a few weeks ago when I finally tried pesto again. My friend Sarah and I stopped to order sandwiches for a quick lunch where my entire reality changed and welcomed me to the world of pesto. Sarah asked for a side of it and naturally, I was curious as to how it would taste after 10+ years so I put it on my sandwich as well and…HOLY MOTHER OF PESTO! This is what I’ve been missing out on my entire adult life?! I should have given pesto more of a chance. And now it’s my latest addiction! In fact I put it on pasta last week, slathered it on my morning toast with some extra avocado slices and ate it with hummus and carrots nearly every day. I might put it on everything until the end of time. Don’t try to stop me. Seriously don’t. Apparently pesto calories add up quite quickly and although it’s packed with mostly healthy fats, I thought I’d do myself a favor and create a bit of a lightened up pesto without any added oil. Did you know that most pesto recipes call for at least 1/4 cup of olive oil? Instead I chose to use avocado for my healthy fat and to create the creamiest base. Just a few simple ingredients and you are on your way to pesto bliss people. -Toss 1/4 cup in with some whole grain or gluten free pasta for an easy weeknight dinner. Add chicken for extra protein. -Stir into cooked quinoa and add a few cherry tomatoes for an easy weekday vegetarian lunch. 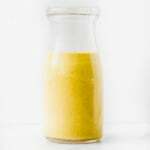 -Use it as a sandwich spread for your grilled cheese; it’ll add a ton of flavor! -Toss in 1/2 cup spinach for extra nutrition! 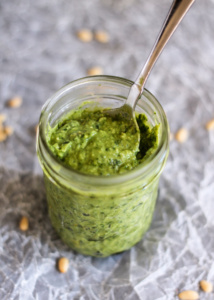 A lightened up pesto without any added oil! The secret is using an avocado to get a creamy texture that's unbelievable! Add basil, avocado, garlic, pine nuts and lemon juice to a food processor and pulse for 20 seconds or until pesto is chopped. Add in water and process again until completely smooth. You may need to add more water to get it to your desired consistency; I like mine a little on the thicker side. Transfer to a bowl and stir in the cheese. 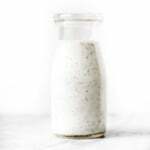 Store in an airtight container or sealed mason jar and refrigerate. Pesto is best if used within a few days, otherwise you can freeze it for several months. You can omit the pine nuts, but I think they add a nice flavor. Chia, Quinoa & Banana Granola Bars Wellness Wednesday: How to Make Naturally Sweetened Greek Yogurt (no sugar added)! 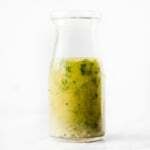 60 Responses to "How to Make Lightened-Up Pesto: A Recipe for Creamy Avocado Basil Pesto"
Thanks for this super delicious sounding recipe! Btw, pinenuts are not really nuts, they’re seeds, so they should be pretty safe für nut allergy sufferers 🙂 Anyway, this recipe will definitely be tried out this week! All nuts are seeds of some sort. I make a similar pesto….but let’s get real, I’m sure Mama AK’s is wayyy better. I love this lightened version! Delicious! Adding avocado to pesto is such a great idea. I am totally trying this. Perfect for wraps and sandwiches. Is it ok if I omit cheese from this pesto? Hi, I was wondering if I needed to toast the pine nuts in a pan or oven? This is absolutely delicious! I toasted the pine nuts which really enhanced the flavour of the dish. I had it for breakfast with scrambled eggs, lunch with brown rice, watercress, zucchini, spring onions, chicken and toasted pepita seeds and a with grilled cheese. This is a new staple for me! Does this brown quickly? By the way I made your turkey chili today and it was my favorite chili ever. Thank you for all your awesome recipes! I’m wondering about whether it browns as well! There’s lemon juice in it so I’d assume that it will not brown. Thanks for this recipe. It sounds interesting. I will totally give this a try. 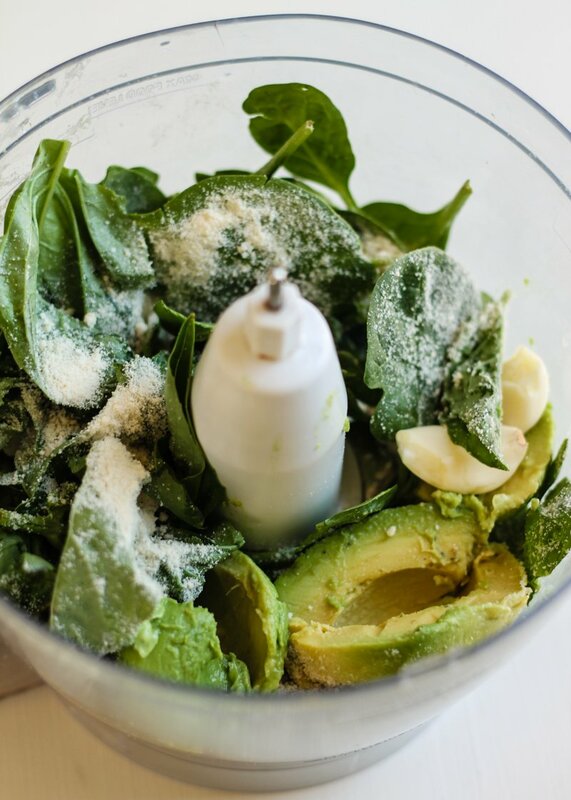 I love avocado and use it in many recipes, and love it in sauces and spreads too. 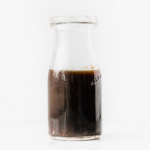 By the way, I just thought I’d mention, according to Dr. Aseem Malhotra, a well known cardiologist and advocate for healthy food and lifestyle in the UK, everyone should consume 4 Tbsp (that’s 1/4 cup) of olive oil every day for a healthy heart and arteries. I make avocado pesto all the time. I love avocados and I love spinach so this is a winning combination. Also I can’t have dairy so the avocado provides a nice creamy alternative which is what I missed the most about cheese. How do you store it? Avocado oxides rapidly. I was able to make my extra avocado sauce last a few days because of the high lemon and oil content. I don’t put garlic in mine and I know the acid from the garlic helps keep it from going bad. Can I make lots of this and freeze it? Ate some recently – they put a touch of fresh chili into it – it’s a brand new world! Looks great! For how long does this last? It should be good for a few days in the fridge, otherwise you can freeze it for a few months! Hi Monique! Just stumbled upon this recipe through Pinterest! I made the pesto for lunch today and absolutely loved it!! Thank you!! I love pesto, and this is my favorite recipe, healthy or not! We live an active life-style, and do watch what we eat. Most pesto’s are diet killers, but not this one! 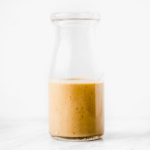 I love to cook and would be considered “a foodie.” Kudos to this recipe as it is creamy and perfect! this pesto sauce looks delicious I’m going to try it…. So happy to hear that David! I love using pesto on pizza. Can this pesto be baked on crust?